Ask fellow campers about "Mill Creek COE" and nearby attractions. This is one of the best COE parks we have stayed in. Extremely large paved sites, utilities all worked well. Satellite coverage was good. AT&T and Verizon worked well. If it were FHU, it would be a 10. Probably the most noise you hear is from the people pulling their turd buckets to the dump station. This is a really great park and early reservations are a must if you want to stay a week. We stayed 4 nights which is about as far as we can get on without dumping or using the public restrooms. We camped at Mill Creek COE in a Fifth Wheel. We stayed 3 nights at spot 49, a pull-through. It was level, clean and shaded with good separation from adjacent sites. The feature that makes this pull-through and the others I saw is the utilities that are on the inside of the pull-through (between the pull-through and the campground access road). This makes it easy to put the front of the unit toward the lake. However because the site is on a narrow peninsula we had good lake views out both sides. We camped at Mill Creek COE in a Travel Trailer. Beautiful campground. Large spots close to lake. Can walk down to lake and fish. Nice area with picnic table, fire pit. Good Verizon signal and satellite signal. This is one of the nicest campgrounds we have stayed in. We had not made reservations. When we arrived on Tuesday the office was closed but the sign said to pick a spot that showed available. I then checked online to see when the spot was reserved. We camped at Mill Creek COE in a Fifth Wheel. To get there from the north we had to go over the Kimberling City bridge. They are working on the bridge so it is down to one lane and it has 9 ft 6 inch clearance. Avoid it if possible. We went south and around the lake when we left. It is scheduled to be completed May 2016. 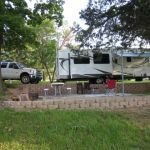 This was one of our favorite COE campgrounds, quiet, all with views of the beautiful Table Rock Lake. A great place to visit Branson, while staying in a scenic beautiful campground. Sites were all very large, paved, and modern. Nice brick walls and picnic tables at sites. The last bend on hill right before the park is scary the first time, but wide enough to navigate easily. Price reflects Golden Age Pass. We camped at Mill Creek COE in a Motorhome. At the time of this review, we're still at this campground (can stay 14 days). We had been RVing for only 3 months when we discovered it (by someone mentioning it to us). What a great place! The only reason I'm not rating it a 10 is that there are no sewer hook ups at the sites. The park is well designed and it's easy for big rigs to maneuver. Many of the sites are directly adjacent to the lake, but I believe all sites offer a water view. Each site has an area with a picnic table and fire pit. There is an area of the lake that is roped off for swimming. There are quite a few flies, so bring repellant, especially if you visit in August. This is one of those places that draws crowds for the weekends, but clears out during the week. We will definitely return here when passing through the area. We camped at Mill Creek COE in a Motorhome. Our first time at this park. I thought this was the best campground we have stayed at in Missouri. The site was within 30 feet of the water. Everything was spotless. We are going to return in July. We will see how things look after a couple of busy months from boaters and fisherman. We camped at Mill Creek COE in a Travel Trailer. This beautiful campground is surrounded on three sides by water. It's in a very scenic, hilly area, less than a 30 minute drive from Branson's attractions, yet far enough away to be quiet. Of the 68 sites, 36 sites are electric only sites, and 23 are electric and water sites; 9 sites are primitive (waterfront) tent sites. Only a handful of pull-throughs are available. Probably not the best campground for really big rigs but perfect for smaller travel trailers, motorhomes and popups. 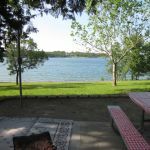 It's a great campground for boating, fishing, swimming or sight-seeing. We live 60 miles from Mill Creek and try to camp there 2 or 3 times between May and October. Many people bring their boats and beach them right by their site. Boat launch and dump station are available. Book early if you need sites with hookups. If there were full hookup sites (and plenty of them!) this campground would rate a 10. Washrooms are adequate and clean but nothing fancy. You'll find families, retirees, honeymooners and fishermen at this campground; COE campgrounds are not tolerant of noisy drunken groups of college kids. If you bring your pet, don't leave it unattended and plan to clean up after it. :) We camped at Mill Creek COE in a Travel Trailer. Are you affiliated with Mill Creek COE ?